NO SCHOOL in the Ste. Genevieve R-II School District on Thursday, February 28, 2019. Fifth grade parents are invited to SGMS tonight at 6:00 for a parent orientation. Please enter through the front doors and meet in the gym. NO SCHOOL on Wednesday, February 20 in the Ste. Genevieve R-II School District. All offices within the Ste. Genevieve R-II School District will be closing at 3:00 pm today on Friday, February 15, 2019. SG R-II will be dismissing students today at 11 am on Friday, February 15, 2019. In order to get them home safely ahead of this storm, lunch will not be served. Please be safe and enjoy the snow!! SGMS Valentine's Dance (2/15/2019) is cancelled due to weather but will be rescheduled. NO SCHOOL on Friday, February 1, 2019 in the Ste. Genevieve R-II School District. Girls Varsity Basketball defeats St. Vincent 56-34. Way to Go Dragons!!!! NO SCHOOL on Thursday, January 31, 2019 in the Ste. Genevieve R-II School District. SG R-II will have school today on Wednesday 1/30/19. Please dress your child in layers with a coat, hat and gloves. If you would prefer to drop your child off at school, all buildings will be open at 7 am. Nolan Walls, 8th Grade, serves as "Principal for a Day" as part of the SGMS Buddies program, Nolan did everything a normal principal would; answered calls, visited with as many classes as possible, supervised hallways, and more. 8th grade girls bring home a conference tournament win against Bismarck 40-14. Great job ladies! Any current 6th or 7th grader interested in trying out for middle school cheerleading for next fall should stop by the office this week to sign the list. Anyone who signs the list will be expected to be at tryouts in April. No school on Monday, January 14 in the Ste. Genevieve R-II School District. All offices within the Ste. Genevieve R-II School District will be closing at 3:00 pm today on Friday, January 11, 2019. Be safe and enjoy the snow!! No school on Friday, January 11, 2019 in the Ste. Genevieve R-II School District. JV Girls Basketball: Ste. Gen falls to North County 23-37. Great effort ladies!!!! Varsity Girls Basketball beats Bismarck tonight ... 67-9. Good job ladies!! 8th grade girls basketball with an impressive win against Bismarck 36-23. Great job ladies! 7th grade girls basketball falls to Bismarck 11-20. Shake it off girls, great hustle. Varsity Boys Bball plays for 5th place at 1:30 pm & Varsity Girls Bball plays for 3rd place at 3:00 pm in the Park Hills Central Tournament on Monday 12/31. Best of luck to both teams. Go Dragons Go!! Varsity boys basketball beats Fredericktown in the PHC Tourney...75-50. Way to go Dragons!! The phones are now operational at SGR-II School District. Thank you for your patience! SG Varsity Girls Basketball beats Valle at the 47th Annual Valle Invitational 52-28. They take first place in the tournament with the win. Way to go ladies!!!! Parents: The Ste. 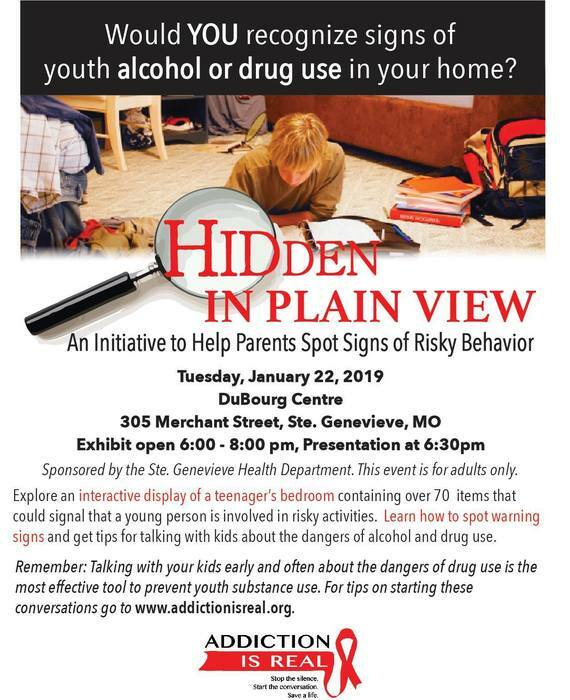 Genevieve Health Department is hosting Hidden in Plain View by Addiction is Real. See the flyer for more information. The special board meeting scheduled for November 28, 2018 at 9 a.m. has been canceled. Thank you. Connectivity to the district has been restored. Phones are operational again. Thank you! Currently, we are experiencing an Internet Outage at the district. This outage occurred at approximately 10 a.m. Providers have been notified and are working on restoring connectivity. Our phones are also on that circuit and are currently down as well. If you need to contact us at the district or any school, please email us at contact@sgdragons.org. Thank you for your patience and understanding! Have a good day! SG R-II will have school tomorrow on Friday, November 16, 2018. Looking forward to seeing all of your happy faces!! There will be no school in the Ste. Genevieve R-II School District on Thursday, November 15. All offices within the Ste. Genevieve R-II School District will be closed on Monday 11/12/2018 in observance of Veteran's Day. They will reopen on Tuesday 11/13/2018. Please remember to thank our veterans and active duty military personnel for their service and sacrifice. The SGHS College Fair is Nov 1 from 6 - 8 p.m. in HS Commons/Cafeteria. FAFSA presentation will be in the Cafe from 6 - 6:30 p.m. You may bring your computers and tax info to get started. Join us for Sectional Volleyball at 3pm as the SG Dragons take on Festus. The link to the live feed is https://youtu.be/2fCFnwjqolE Go Dragons!! The Ste. Genevieve R-II School District is in need of Substitute Teachers for the current school year. If you currently have 60 College Credit hours and are interested, please contact Mrs. Donna Huck at 883-4500 ext. 2005. The parade is still on for 5 p.m.! Come on out and enjoy the floats and the band. Then, have some chili and hotdogs in the cafeteria. Supper is served from 4 p.m. to 7 p.m. in the cafeteria. Come on out and enjoy homecoming! Join us live as two of SGMS's finest shave their hair for a great cause! The SGHS Band Boosters Annual Homecoming Chili Supper is this Friday on October 12th from 4 to 7 pm in the cafeteria. Menu: bowl of chili ($2), hot dog ($2), drinks ($2), chips ($1), and desserts ($1). Please come enjoy a great meal before the game. The SG R-II Board of Education voted at the August meeting to set the SG R-II Summer of 2019 MSHSAA Dead Period for Activities for June 29, 2019 through July 7, 2019. Best of luck to all dragon parents as they now work to plan their family vacations! Some important upcoming dates: Jul 28 - Aug 5 Dead Period Aug 8 - 9 BLE, SGE New Student Registration Aug 8 - 9 MS/HS Registration Aug 16 - First Day Of School Have a wonderful summer!